For different editable versions, click here for the source doc in OpenOffice format. This chart is a kind of nomograph; you select your film speed on the left, follow the line through the current weather/lighting condition in the middle, and you’ll find out which aperture to set the Diana to on the right. I didn’t put the little icons from the Diana on this chart on purpose as they are bit misleading. Just remember that f/22 is the smallest aperture, and is the little sun icon; f/11 is the biggest aperture, and is the cloud icon. On the right side is a 35mm turn advance guide. I have my Diana’s winder knob marked off in ‘hours’, or 12 spaced tick marks, so this is the number of ‘hours’ per frame that you should turn the knob. So a ’12’ means one full turn. 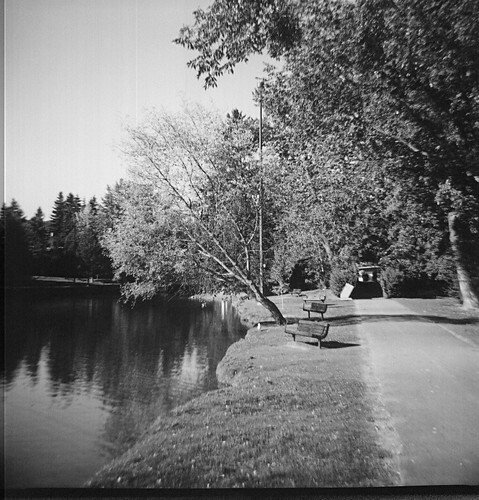 The X at the start is to load some film before shooting the first frame, and the bold ’10’ is where a roll of 24 exp might run out… same deal with the last ‘!’… you may or may not get this frame, depending on how accurately you’ve been winding. With very little digging I found a chart at Indian Hill imageworks that gives a great summary of exposure times. But it was a little ‘big’. I tried printing it small, and hacking off the bits I don’t use, but still wasn’t happy. I wasn’t really sure about the EV descriptions, either. So another 2 seconds of Google and Wikipedia had this to say about Exposure Values. So now I could use more meaningful descriptions (at least to me), and I could use only the ISO values that I was shooting at to create my own chart. I also wanted to put something on the back of the chart. Since I sometimes shoot with 35mm film loaded, why not a film advance guide that gives the number of turns per frame? With 35mm loaded there little red window is taped over, so you do have to guess a bit. I started with this chart over at Photon Detector… but again… wanted something smaller. I also confirmed the number of turns by both putting film in the camera with the back off and counting as I advanced, and of course by shooting some film and checking the results. Depending on what you are using as a take-up spool, and if you use any masks, you might want to change these numbers. Now, time to get out there and do some shooting! If you are an iPhone user, and a photographer, you probably have already heard of an idea / application / book / website from Chase Jarvis called “The Best Camera“. Overall the concept seems to borrow heavily from the Lomographic Society and their branding; lots of lomo-style images to get you fired up; lots of filters to create lomo-style images; and lots of ways to share them, right from the phone. To be fair the style isn’t owned by Lomo, and Chase Jarvis did some work in this style that was (as I understand it) well known and liked before the amateur craze started. It’s got warts and growing pains, but the ability to change the order the effects filters are applied in, learn from others and how they used the filters, and get some inspiration from the constantly changing live feed on the app on the website… it makes the iPhone camera worthwhile – even my crappy 3G camera. It’s more fiddly, with more options, so it takes longer to get a ‘finished’ shot than with Polarize, but the effects can be similar. It can also use an image from the camera roll, so you can always mix and match. The camera app doesn’t have ALL the possible controls, but the selection is good. The filters that you apply don’t have individual adjustments of their effects. The shutter button is small, but at least it takes the shot when you release it, not when you press it. When you share an image via twitter, there is no option to add a title or description to the tweet. The web site needs a way to find images by a specific user, I think. That might make it too flickr-like, but unless you save the images to your phone or email them to yourself (and don’t delete the emails, like I did…), you’ll lose the images forever! But overall it’s pretty cool, and worth the $3 for it in the App Store. An image processed with the Best Camera app. Click to see the filters applied. Comments Off on The Best Camera ? I shot a roll of Ilford XP2 Super 400 last week, and was all excited to develop it… until I realized that although it was black & white, it needed C-41 development! Ooops! I bought it on a lark without even reading the box, just to take it for a spin, so not a huge deal. For development I took it to Vistek, since they seemed a likely place to get C-41 120 format film developed, and they did a great job. If only my scanner was up to the job! Most of the scans have streaks in them; in some I’ve minimized them with some digital editing if it was overly distracting. One technique that worked really well, and is a HUGE cheat, was to shoot every frame digitally first. I had my K10D with 28mm lens set to ISO 400, 1/60, and read the aperture right from the cameras meter. To confirm I did the shots in digital, and it also helped that I had set the camera to use full stops instead of halves or thirds of a stop. So besides a double exposure on the first frame, I ended up with a roll of perfectly exposed film, and 12 usable (if some boring) shots, which was sort of surprising. 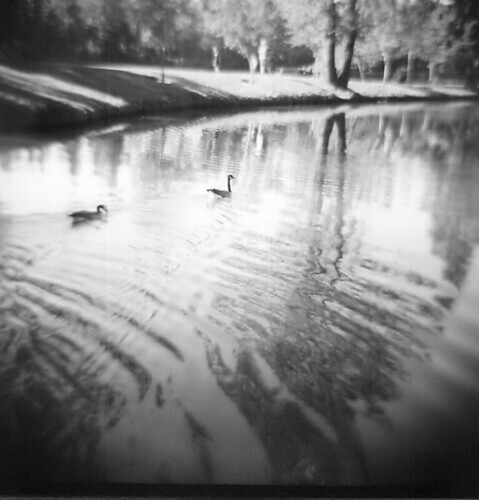 The bigger surprise, however, was the clarity of the Diana F+ and it’s plastic lens in some shots. And the not-clarity in others. To get super-crisp shots is almost disappointing; I’d rather they came out all funky and weird! All of these images are hosted over at flickr, and you can see higher resolution versions of them there. Decent clarity, nice contrast. Surprise! Or not so clear. Surprise! The interaction between aperture and focus is really pronounced on this camera. Even though the estimated apertures of f/11, f/16, and f/22 seem to be grouped at the slower end, the depth of field can vary from almost infinite at f/22 @ infinity focus to really shallow at f/11 @ 1-2 meters. It’s almost a 50-50 split between the sharp and soft shots from that day. The physical prints are fairly impressive in their own right. Although they were only printed at 5″ x 5″, they show a bit more shadow detail and tonal range than the scans do. I was expecting something less crisp; what I had read about this type of chromogenic film was to expect ‘dye clouds’ instead of silver particles… well, that’s not exactly accurate. At large print sizes I could see it contributing to the overall quality, in fact I could see using this film for just that effect with the Diana, or any Lomo camera, especially when it could be printed at poster sizes, or bigger. I think I’ll compose some images for printing at LARGE sizes and see what I get. 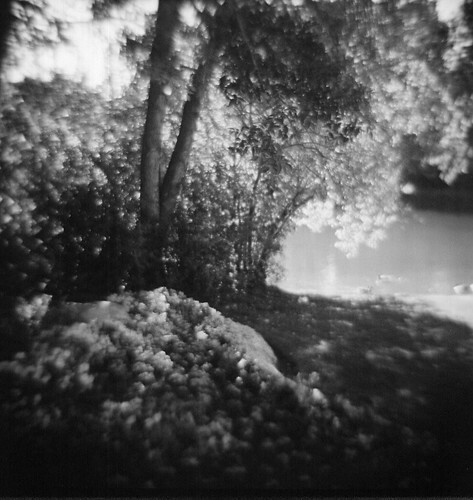 Right now the Diana has some of that no-name Lomo film in it, and then I have some T-Max and Delta that are going for a head-to-head in my developing tank, so look for more black-and-white goodness over the next few weeks. Nope, this is cross-processing; the intentional developing of one type of film in chemistry intended for another. You’ve seen the look; like Kodachrome, but more vivid, darker blacks, and blown highlights, and often incorrect or unnatural colors. 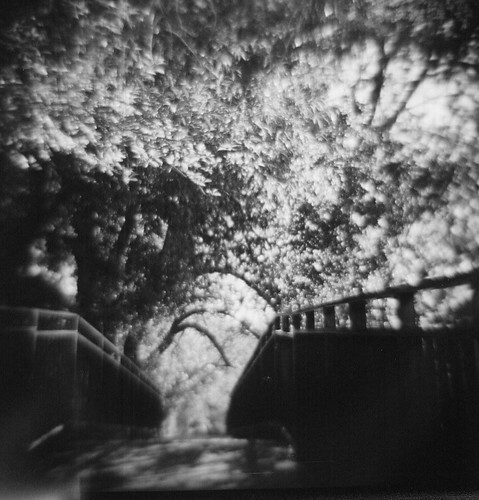 When I got the Diana F+ one thing that drew me to it were the samples; unreal colors and flaws that are really difficult to produce by editing digital, if only because of their apparent randomness. My first couple of rolls were some Lomo 120, ISO 100. Not bad for outdoor use in bright light. But black and white; and I developed myself – the first time in 25 years, so a little lacking in deep blacks. But that’s another post. My third roll, and one I was dying to shoot, was some Fuji Sensia ISO 100, a slide film. 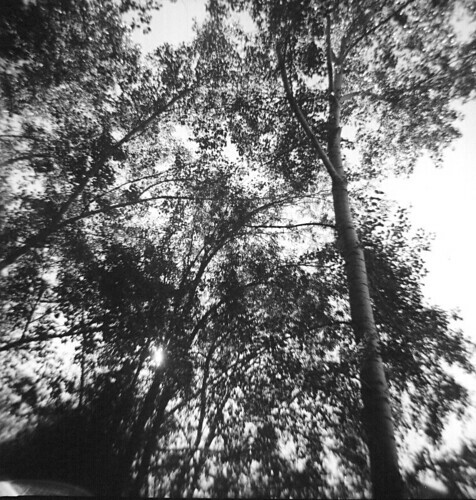 I had purchased it intending to use in the Kodak Stereo Camera on a mountain hike, but the hike evaporated, and there sat the Diana, just begging for some color film. The first surprise is how hard it was to get it processed here in Calgary. Within 15 minutes of me are probably a half-dozen drug-store processing machines, all C-41 (print chemistry). What I had was slide film, or E-6 chemistry. I did a little leg work and found that neither WalMart or London Drugs would take it, first citing fears that I wouldn’t like the results, and second that it might somehow gum up their machines. I did a little reading after that, and found that the only film that’s likely to do that is Kodachrome – no longer available. (There are others, but likely to be in unmarked/self-loading 35mm cans). In that search I found a local lab that would process it ‘wrong’ for me, but I’m going to have to keep it a secret; I don’t want a sudden influx of hobbyists flooding the lab because they don’t make much (if any) money from it. If you have a roll, live in northwest Calgary, just do some leg work (and a Google search). You’ll find it. The next surprise was that the slide film came back as a negative… I hadn’t thought about it; all the shots that I’d seen online, even those with sprocket holes, seemed to be clear slide film. A thread over on APUG showed me the light; the chemistry dictates if the results are positive (slides) or negatives (for prints). 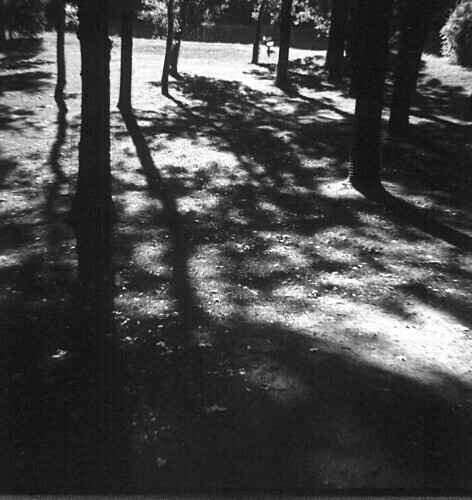 The scanner did some pretty funky things to the scans if I told it to ‘scan as negative’, so I lied to it and said it was a slide. Also, for this sample strip I did NOT use the film loader; it hides the sprocket holes! I put the slide into a print carrier, which is just a bit of clear plastic with a white paper backing that is only sealed on one edge. Great for feed loading delicate items, like this. But the big reason why I like this way: I get sprocket holes. This is really straightforward: I loaded the image into the GIMP (think ghetto Photoshop) and selected ‘Invert’ from the Colors menu. That’s it. I saved this step as another TIFF file also, so I could come back to it if needed. These files aren’t high resolution, so the files are really small, about 2.4 MB. This is where things get personal. I used the curves editor to drop the red a few notches, and bump up the blue and green. In the curve grid I simply drag the point from the right hand corner; straight down for red, and straight left for green and blue. Play around until you get it ‘right’. It’s possible to actually get colors that are really normal – but where is the fun in that? That’s really all there is to it. 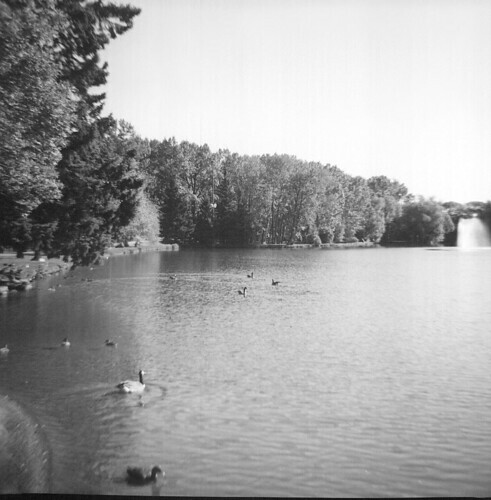 You’ll notice that I didn’t get the film advance right, and one frame is damaged. Meh. That’s part of the process. If you don’t want overlapping frames then take the time to load and count turns; I used about 1.25 turns at the start of the roll which was waaaay to few; and 2 turns in the middle – waaaay too many; and about 1 turn at the end… which was about right. That sounds like a whole ‘nother post, so I’ll leave it at that. My flickr page has a few more samples, sans sprockets. Comparing the two: Sprockets Rule! I just tried to have a roll of color slide film shot with my Diana F+ cross-processed at the local Royal Oak Wal-Mart in Calgary last night. The kids looking after the photo counter were afraid of ‘ruining’ my film. That has to be one of the funniest things ever, since the chemistry of cross-processing has just that effect. So I thought I’d wait until later today, and see if I could get one of the nice day-shift techs at the London Drugs next door to take a stab at it. They were excellent with the oddball film from the Kodak Stereo camera, so this should be a breeze for them. No dice at the Royal Oak London Drugs, either. They’d never heard of cross-processing, and thought it might damage their machine (ie, contaminating it’s chemistry). They thought they might be able to do it if they sent it into their custom lab, but I doubt that the lab would understand, either, and would either process it as slide (wrong) or cut it (wrong), or god knows what else. Next stop… Vistek. The only camera store in Calgary that has ever been rude to me. I’m sooo looking forward to this.